When it gets to above 70 degrees, I hate to heat up my house with the oven...so sometimes I feel like non-cook items for dinner. This was the case tonight, so I thought a nice cool and crisp salad would be just the thing. I had some feta in the fridge that needed to find a home, so I came up with a dressing combining it with lemon and olive oil to dress my salad. Since this dinner was taking on a Mediterranean direction, I thought some cherry tomatoes, and kalamata olives needed to join the party...as well as some zucchini for variety. Butter lettuce was my green of choice, and I sprinkled a little alfalfa sprouts on top of the finished salad because I love them! The salad was refreshing and perfect alongside a piece of grilled fish! To make dressing, combine 1/4 cup feta, lemon juice, olive oil, dill, and salt and pepper to taste in a food processor, and process until smooth. In a large bowl, combine the lettuce, cherry tomatoes, zucchini, and olives and toss with enough dressing to coat. 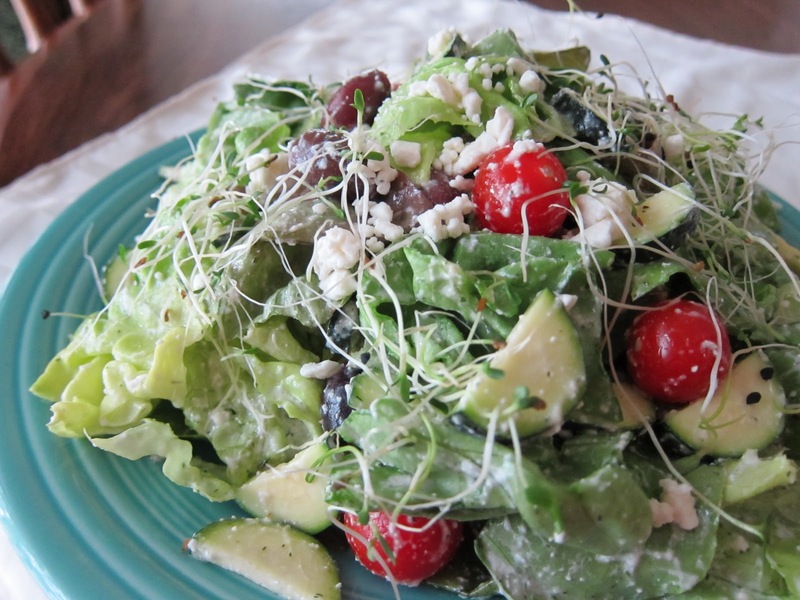 Divide salad between 4 plates, and sprinkle a Tbsp of feta and a few alfalfa sprouts on top of each. Hey Amy, me too! Not only do I not want to heat up the house, but I'm not as hungry when it's hot. I like something cool and light. This salad looks tasty. Me Likey! This salad looks so good. I really like to eat light on hot days. Thanks for sharing! I wish it would get to 70° here! Today it's pouring rain again but on a positive note your salad looks yummy and like summer!